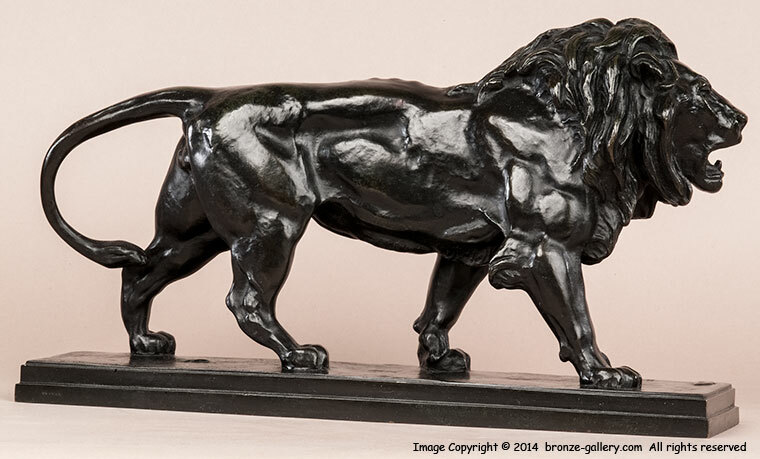 Barye is best known for his bronzes of the big cats and the Walking Lion is one of his most famous sculptures. The model was first created in the 1840s and it has remained popular well into the 20th century. The famous Barbedienne foundry cast the Lion Qui Marche for many years and their casts are of very fine quality. It is a icon of Barye's work and examples can be found in museums and collections world wide. This powerful Lion also has been used as a symbol by MGM studios who issued a copy of it. The muscle structure of this powerful beast is sculpted in such perfect detail that you can see the ripples as he strides along. The Lion's mane is shaggy and well detailed, his mouth is partly open and the whole animal gves the impression of strength and power. 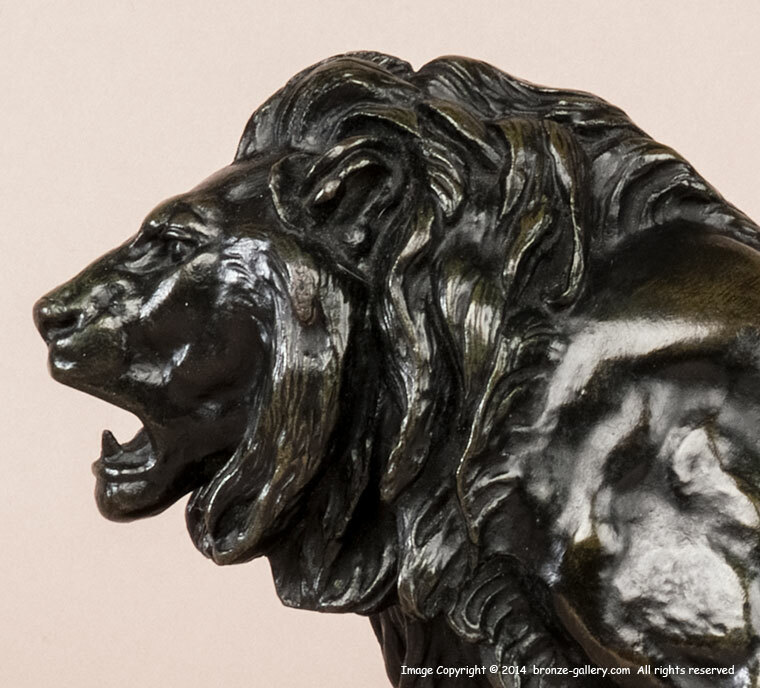 Barye sculpted a Walking Tiger as a pendant to this Lion but the Lion looks very well on his own. The Lion qui Marche has been copied in plaster and other materials over the years. The Caproni Brothers company in Boston during the early 1900s made plaster models of many famous bronzes and this Lion was one of their most popular sculptures. Caproni plaster casts were sold to schools and teachers to use as examples and even though plaster is fragile, many have survived today. This bronze was cast in the 19th century by the Barbedienne foundry and has their mark of "F.BARBEDIENNE Fondeur" inscribed on the base. 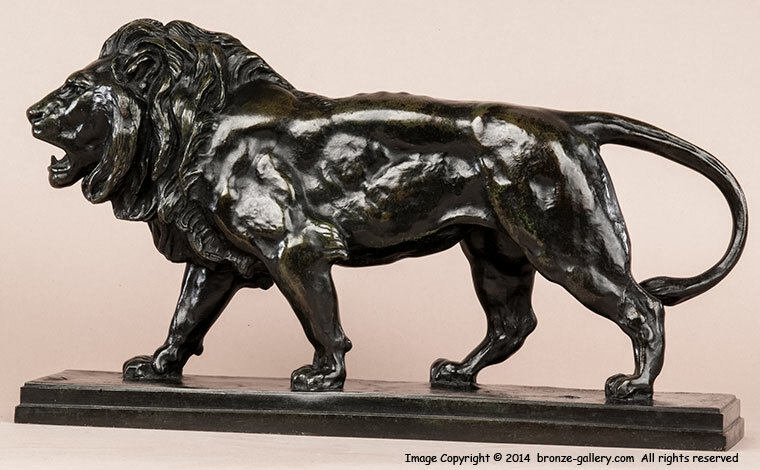 The Lion is finished in a rich dark green and black patina. Barbedienne cast both the Lion and Tiger starting in the 1860s for some years and these bronzes are much prized today. Art Bronzes by Michael Forrest, pg. 168. Les Animaliers by Jane Horswell, pg. 68. Bronzes of the 19th Century by Pierre Kjellberg, pg. 65. Muse Decorative Arts, Paris, France.